MetLase, the joint venture between Rolls-Royce, one of the most famous names in engineering throughout the world, and Unipart Group, a leading provider of manufacturing, logistics and consultancy services, is taking 10,000 sq ft of space on the Advanced Manufacturing Park (AMP) in Rotherham. Based on proven and patented Rolls-Royce technology, MetLase provides innovative engineering solutions to applications where precision and speed of deployment are increasingly critical. Initially focused on aerospace, automotive, motorsport and the medical market sector, the new company said last year that it will initially create around 30 high-end, technical engineering jobs at its new headquarters on the AMP. Management and lettings agents, Creative Space Management (CSM) has now confirmed that MetLase is the first letting at the new 32,000 sq ft office and workshop building, that is already 50% let before it opens next month. Landowners, The Homes & Communities Agency (HCA), which took on the assets from Yorkshire Forward, contracted Scunthorpe-based Britcon last year to build the next phase of development at the AMP Technology Centre - the park's incubation space. It is anticipated that the building will provide SME companies from the initial centre the opportunity to expand into larger premises, as well as attracting high technology companies from further afield. Home to companies such as Fripp Design, Bromley Technologies, nCode, Iceotope and Eadon Consulting, the centre is owned by the Homes and Communities Agency (HCA) and has maintained occupancy there close to 100% while supporting companies to grow into units further afield on the AMP. Paul Taylor from Creative Space Management, said: "We're delighted to welcome MetLase as the first letting for the new building. 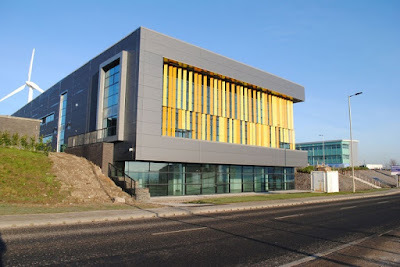 There are very few developments in the region which can accommodate specialist advanced engineering and manufacturing companies, but this building had been designed with exactly those types of companies in mind. "As well as offering a mix of both office and workshop units, its Enterprise Zone location means that eligible business will benefit from business rates relief. We'd encourage companies working within the sector who are looking to expand to contact us now, as we expect a high demand for the limited number of spaces available." Rolls-Royce has a long association with the UK's premier advanced manufacturing technology park, being a lead commercial partner with the University of Sheffield Advanced Manufacturing Research Centre (AMRC) and opening its own £110m factory - the most advanced turbine blade casting facility in the world. MetLase uses manufacturing techniques such as CNC laser-cutting and press-brake material forming, which are combined to produce both simple and complex tooling, fixturing and components within significantly reduced lead times. Steve Dunn, managing director at MetLase, said: "We're looking forward to moving into the purpose built units at the new building. MetLase is an entrepreneurial business that provides bespoke engineering solutions to complex problems where precision and speed of deployment are critical. The site offers us the flexibility in which to grow in line with the demands of the market." Rotherham Council has recently approved plans submitted by Metalysis that will see the innovative firm take a 22,000 sq ft unit to create a process facility for its patented low-cost way to manufacture titanium and other specialist powder metals.